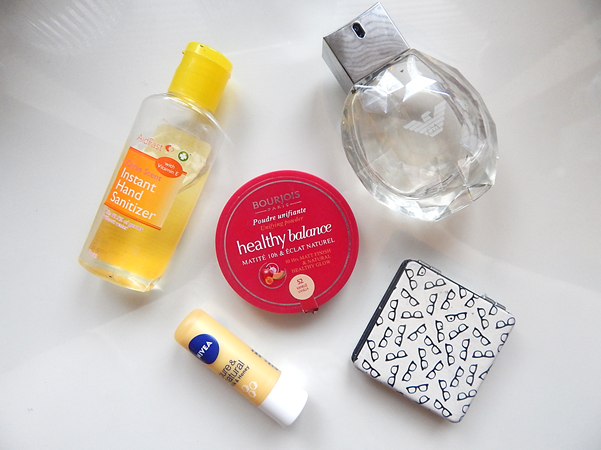 The beauty ideal: My 5 Handbag Musts. Since most of us girls carry a handbag on a pretty much everyday basis, it's important to fill it with the bits and bobs that would actually come in handy...not 6 magazines, 3 canisters of chewing gum and countless Nandos receipts which I'm not guilty of at all...ahem. For me, powder is a must for day to day. As you already know by now, I suffer from oily skin and it's not fun when Mr Shiny-Shiny makes a glowing appearance on my forehead, nose and chin half way through the day. The Bourjois Healthy Balance powder is my go-to for setting my makeup and touch-ups. A mirror is usually a good call if you, like me, touch up your makeup throughout the day. As a rule I don't really like using public toilets so not only do I have a bladder of steel but I'm required to carry around something to see my reflection in. I'm crap at re-applying makeup without a mirror, I tend to get lipstick in my eyebrows. You can pick these up from pretty much anywhere - Primark and Wilkinsons do compact ones with lovely patterns. Perfume or some sort of body spray is a constant addition to my handbag - I just can't seem to leave the house without it. Aint nobody got time for the stanky-stanky when you're out and about enjoying yourself. I was addicted to those Charlie sprays in high school - are they even still going anymore?- now it's usually a smaller version of one of my favourite scents, in this case Giorgio Armani Diamonds. I wish they'd just bring perfume rollerballs to the UK already. Hand Sanitiser is another good one to be carrying around with you - you really never know when you might need it. Now I'm not a germophobe nor a hypochondriac but public door handles/stair railings/elevator buttons are just breeding grounds for pretty much anything. There's just some things I'd rather not take chances with. Soap & Glory do a good one but I usually get mine from the pound shop, they tend to come in packs of 5. Lastly is a lip balm - or several in my case. Most of the time I can never be bothered re-applying my lipstick so it's easier to just whack out the lip balm (the only beauty product I can apply without a mirror). I prefer to carry stick forms around with me just because it's less messy and I've permanently got a Nivea's Milk & Honey somewhere at the bottom.